Goa was under the Portuguese rule from 1510 CE, they set up a permanent settlement in Velha Goa and begin the Portuguese rule in Goa for at least four and half centuries till the annexation in 1961. Today Panaji is completing 175 years as Goa’s capital city. The old capital of Goa was Velha Goa, it was plagued with series of epidemics of malaria and Cholera in the 17th century. These epidemics raised sanitation issues and People migrated to new Goa. Hence, the Portuguese administration was forced to shift it to Panaji. Panaji was also known as Nova Goa, during that time it became the fourth capital of the Portuguese Goa. Historian claim that Panaji was already the capital but the when it elevated from town to status of the city, due to migration on March 22, 1843, its importance as the capital increased. 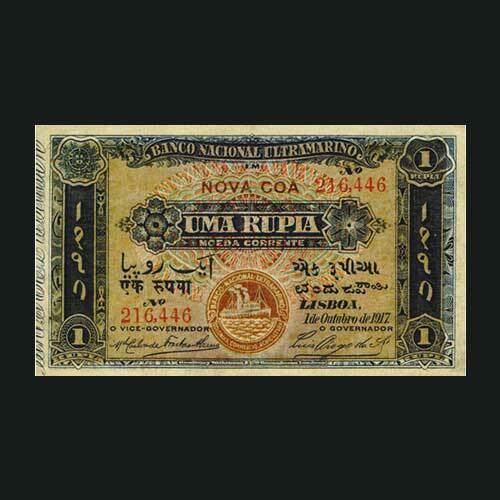 To commemorate the celebration of this day we would like to share the paper currency, Uma Rupia of Portuguese Goa issued in 1917 with the initials of Nova Goa on the top.